End dates on the test reports for our products are recognized as Retention dates. Labeled as an Expiration date gave the impression that the report actually expired, which it didn’t unless we changed the product. 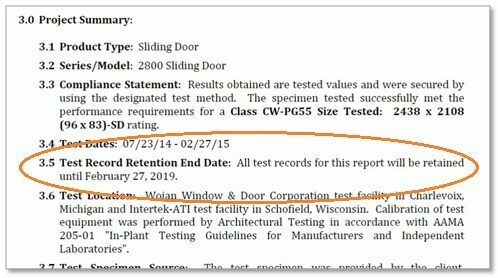 The Retention date means the test lab will retain the cut-up test window samples until that date so they can be inspected if there were a question about their structure in relation to the test report statements. When we have a retention date pending, we can then ask the lab to send the test window samples to our facility instead of disposing them. Test reports are a historical record of test results on specific test specimens, tested to a defined standard or standards; a “snapshot” of the product at a certain point in time. Laboratories may include expiration dates on their test reports that reflect their individual policies. These expiration and/or test record retention dates will vary from laboratory to laboratory and test report to test report. As historical records cannot technically “expire”, these dates are arbitrary. In the event that no changes are made to the design and/or construction of the product as documented in the test report, it is the position of AAMA that the test report remains valid as a reflection of the facts as of the date of the test.